Sabrina Heiser wrote this post as a project for Stacy Krueger-Hadfield’s Conservation Genetics course at the University of Alabama at Birmingham. 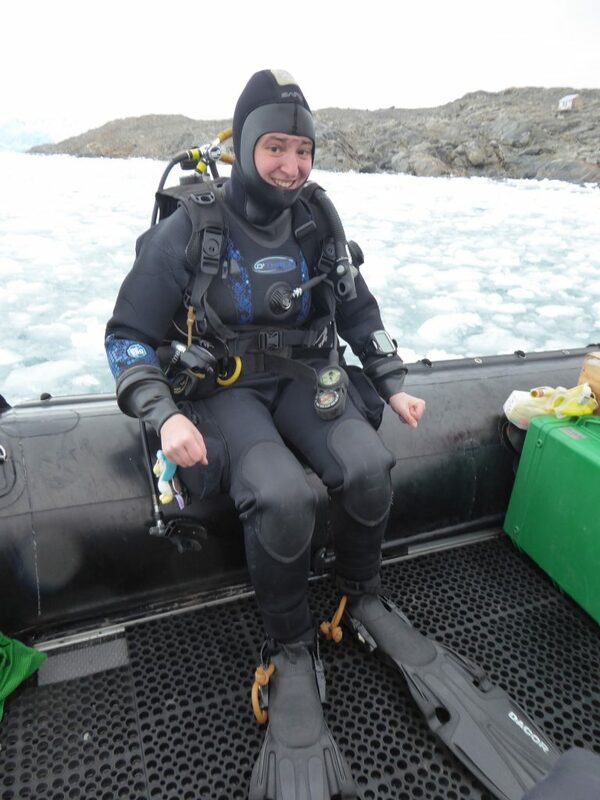 Sabrina grew up in Germany, completed a BSc (Hons) in Marine Biology at Plymouth University (UK) and then lived in Antarctica for 2.5 years working for the British Antarctic Survey (see more about her story here. Now, as a PhD student in Dr. Chuck Amsler’s lab at UAB, she is finally able to combine her love for macroalgae and the Frozen Continent, where she is investigating algal population structure and how gene flow shapes the distribution of geographic patterns in physiological traits. Sabrina tweets at @sabrinaheiser and you can find out about her research on her website. What makes Antarctica so interesting to study? Antarctica is surrounded by the Southern Ocean and is separated from the other oceans by the Antarctic Circumpolar Current (ACC) and by the Antarctic Polar Front (both of which are indicated in Figure 1 by the lines APF and SACCF). The ACC was established in the middle Miocene around 15 million years ago (Hommersand et al. 2011; Lawver et al. 2014) and since then the continent and its ocean has been separated, giving the ecosystem time to evolve independently. But what if Antarctica is not as separated as we believe it to be? Drifters reaching Antarctica is old news. There are records from an expedition in 1909 collecting the southern bull kelp (Durvillaea antarctica) from the Deception Islands (Zaneveld, 1993) which is not far from King George Island where Fraser et al. (2018) collected the same southern bull kelp, a brown seaweed with a unique honeycomb structure in its blades permitting it to float on the surface of the ocean (Figure 1). They wanted to determine its origin as the southern bull kelp does not grow in Antarctica and would have to cross the strong ACC. Figure 1: a) and c) shows Durvillaea antarctica washed up on a beach. b) shows the origin and trajectories of seaweed found at King George Island. a) Image by Stug.stug ; b) and c) from Figure 1 in Fraser et al.(2018). Fraser and colleagues used a population genomic approach to trace where the drifting seaweeds originated from: the sub-Antarctic islands South Georgia and Kerguelen (Figure 1). 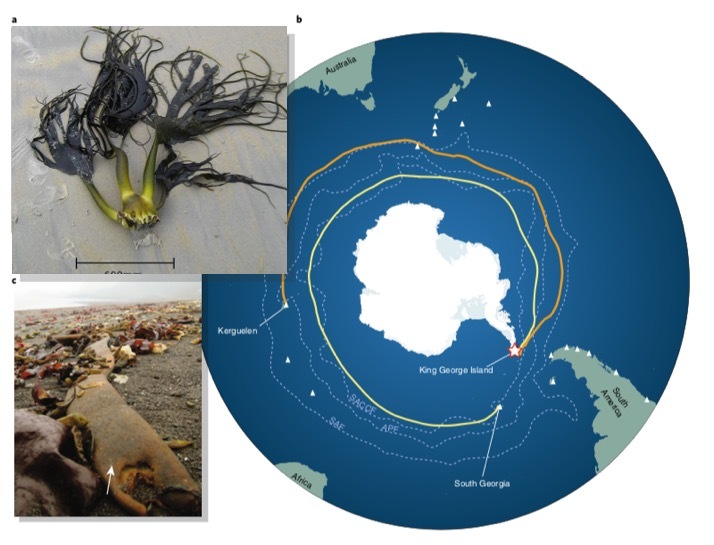 Not only did the seaweed make it to Antarctica, but some of the individuals were fertile. They also brought along a number of hitchhiking invertebrates. In Video 1, you can see how the Stokes drift, where wind blows and transports floating objects on the ocean surface, and eddies work together to transport drifters released from sub-Antarctic islands, across the ACC to Antarctica. All of the orange dots eventually reached the icy continent. By running the simulation with just one of the two forces (Stokes drift or eddies), none of the dots reached Antarctica. Therefore, it is important to take both forces into account. Video1: Simulation of particles released from South Georgia, particles in orange reach Antarctica, particles in blue do not. From Fraser et al.(2018). As Robert Falcon Scott said, “Great God! this is an awful place and terrible enough for us to have labored to it without the reward of priority.” Who knows – maybe, climate change will realign some of those priorities and new arrivals who come from warmer terrains will settle and flourish. However, who the losers are, is another story. Fraser CI, Morrison AK, McC Hogg A, Macaya EC, van Sebille E, Ryan PG, Padovan A, Jack C, Valdivia N, Waters JM (2018) Antarctica’s ecological isolation will be broken by storm-driven dispersal and warming. Nature Climate Change. 8:704-8. Hommersand MH, Moe RL, Amsler CD, Fredericq S (2011) Notes on the systematics and biogeographical relationships of Antarctic and sub-Antarctic Rhopophyta with descriptions of four new genera and five new species. In: Biology of Polar Benthic Algae (ed Wiencke C),pp. 51–98. Walter de Gruyter GmbH & Co. KH. Lawver LA, Gahagan LM, Dalziel IWD (2014) Reconstructions of the Southern Ocean Antarctic Regions. In: Biogeographic Atlas of the Southern Ocean (eds De Broyer C, Koubbi P, Griffiths HJ, et al. ), pp. 36–42. Scientific Committee on Antarctic Research. This entry was posted in blogging, DNA barcoding, ecology, evolution, genomics, haploid-diploid and tagged Blogging, Kelp, Science Communication, seaweed. Bookmark the permalink.